The Thousand Islands Decoy Collectors Association (TIDCA) was organized in summer 1992, largely through the efforts of Larry Lunman and Bob Rayfield, to bring together individuals who share a common interest in the history of decoy carving and waterfowl hunting along the St. Lawrence River. In addition to the Clayton Decoy Show held each year in July, TIDCA members have met once or twice a year to attend decoy presentations, share information, and participate in displays and contests. Vintage decoy displays and contests have been a feature of most meetings, with the intent of encouraging members to bring choice examples from their personal collections to be studied and enjoyed by all. In spring 2009, TIDCA was reorganized under the mantle of the TI museum, and individuals who wished to become or remain members of TIDCA could do so by joining the museum. The goals of the association have remained the same, and are focused on discovering and sharing information on the decoys and decoy carvers of the Thousand Islands area. In recent years, two events have been held annually, both open to the public. The first event is a meeting held the first Saturday of March, the second includes displays presented at the Clayton Decoy Show held the third weekend in July. Displays of decoys by TIDCA have been presented at the Clayton Show each year since 1994. In 2013, TIDCA’s involvement in the Clayton Decoy Show was expanded to include a vintage decoy contest. Archives of information presented at previous spring meetings, and pictures and information from previous July Clayton Shows, can be accessed using the links on this page. Click on the Previous Spring Meetings link shown here or at the bottom of the page to see topics covered at all the spring TIDCA meetings since 2001. By clicking on the colored links associated with each of the yearly spring meetings, PDF versions of the presentations and handouts can be accessed. Click on the Previous Clayton Shows link shown here or the one at the bottom of the page to see the themes of the TIDCA displays since 2001, and the categories in the TIDCA contests since 2013. Pictures of the displays and contest winners shown on the page can be enlarged by clicking on them. Pictures and information used as part of the TIDCA displays since 2010 can be accessed by clicking on the colored links associated with the respective yearly headers. The 2018 spring meeting (March 3), and the TIDCA display and contest at the 2018 Clayton Decoy Show (July 20 and 21), were held as scheduled. We had an above average turnout at the 2018 spring meeting, although not quite as large as 2017. We hope this higher level of involvement seen the last two years will continue in the future. Materials presented at the spring meeting and Clayton Show, and photos from the Clayton Show, have been added to their respective archive pages, and can be accessed using the links on this page. Spring Meeting: March 2, 2019 at the Thousand Island Museum, 312 James St., Clayton, beginning at 12 noon. Similar to previous years, the meeting will start with decoy displays and an informal gathering, followed by a slide presentation. The meeting is open to the general public, free of charge, and refreshments will be served. Please feel free to spread the word, and invite anyone you feel may have an interest in the decoys and history of our area. A power-point slide show will begin at 2 PM. Topics to be covered in the 2019 presentation have not yet been completely finalized, but will likely focus on three area carvers and families, including Bob Belyea, from Potsdam, and the Hunter and Gove families from Hammond and Alexandria Bay. A brief review of decoys by Theodore M. (Ted) Denny may also be included. The slide presentation will finish with a mix of news and information concerning decoys and decoy collecting in the Thousand Islands area. Some changes or additional topics to be covered during the spring 2019 meeting may be announced, and it is suggested that you check back in February for any new information. Uncovering new information about the decoys and decoy carvers of the Thousand Islands takes a lot of work, some luck, and is greatly facilitated by the right contacts. Beginning a discussion of new carvers often encourages those with information to come forward. Help is needed. Anyone is welcome to add to our presentations, either as a new presenter or as a source for new information. Audience participation is encouraged, and anyone with information or photographs of any of the area decoy carvers is asked to bring them along. Pictures of recently discovered decoys are always welcome. If you have some news or information that you would like included as part of the meeting, please contact Tom Eckert prior to the meeting at 315-654-2902 or teckert@twcny.rr.com. Decoy displays are a traditional part of the TIDCA meetings. The intent of these displays are to provide people an opportunity to examine decoys by various makers, and to better understand the variations in style and construction that exist. The public is invited to bring decoys from their own collections for everyone else to examine and enjoy. This includes decoys that they feel fits with the topics of the slide presentation, as well as decoys they would like to have identified and appraised. Decoys and carvings Bob Belyea or any members of the Gove or Hunter families. This includes hunting decoys, decorative carvings of any type, paintings, and sketches. Decoys and carvings by Theodore M. Denny. Any decoys or carvings from Thousand Islands area makers that you would like to see discussed at a future TIDCA meeting. Clayton Decoy Show: July 19-20, 2019, Gordon Cerow Recreation Park Arena. TIDCA involvement in the 2019 Clayton Show will include a decoy exhibit to be displayed all day Friday and Saturday, and a decoy contest to be held on Friday. Help with setting up the displays, registering the contest decoys, and supervising the exhibits and explaining them to the public, is always appreciated. If you can help, please contact Tom Eckert at 315-654-2902 or teckert@twcny.rr.com, or contact the Thousand Islands Museum. 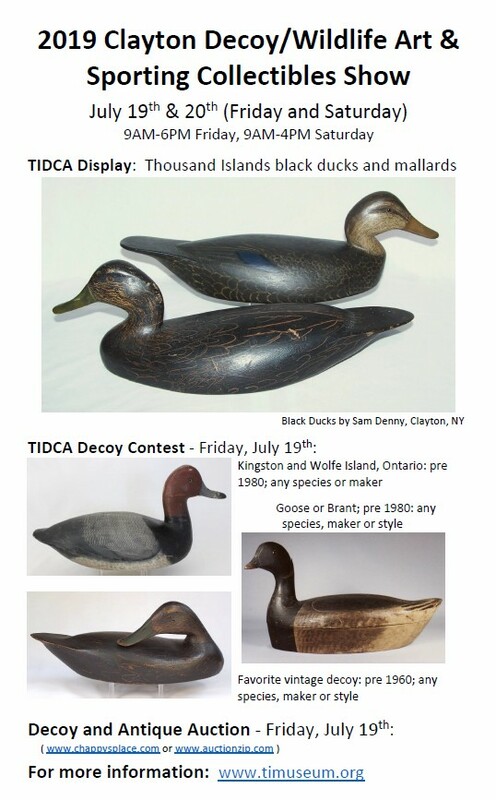 The 2019 TIDCA decoy exhibit will feature vintage black duck and mallard decoys by carvers from the Thousand Islands area. Black ducks and mallards are the two largest species of marsh ducks, and both are favorite quarry of duck hunters. Mallards are currently the more abundant of the two species in the Thousand Islands area, but that was not always the case. Black duck were far more abundant than mallards through the 1940s, and many of earlier decoy carvers produced relatively few hunting decoys for mallards. The 2019 exhibit will focus are better examples of black duck and mallard decoys by any of the areas carvers. Museum members and decoy show participants with a choice example of a vintage black duck or mallard they would like to be considered for display are asked to contact Tom Eckert (315-654-2902). The 2019 TIDCA decoy contest will be held on Friday, July 19. The contest is open everyone, and each person may make two entries in each of three categories. A matched pair (hen and drake) count as one entry. The entries may be brought in person to the TIDCA tables and registered from 9-11 AM, or may be mailed to the TI Museum according to the same procedures established for the Hunting Decoy Contest. Entries in the contest will be judged by a panel of three experts beginning at 11 AM. Ribbons will be awarded to the entries judged to be 1st, 2nd, and 3rd, in each category, and the winning entries must remain on display until 5 PM Friday. The contest categories selected for 2018 are quite broad, and were intentional chosen that way to encourage more participation. 1. Decoys from Kingston and Wolfe Island, Ontario, made before 1980, any species or maker. 2. Goose or brant made before 1980, any species, maker or style. 3. Favorite vintage decoy made before 1960, any species, maker or style.